Planning a fall color wine tour in Northern Michigan this year? We’ve gathered a few tips to make the most out of your next wine tasting trip from Traverse City to Leelanau or Old Mission Peninsula. • Bottled water. Here’s a tip from the Kathy at Bel Lago, "For a successful wine tour, drink as much water as you do in wine. And be sure to eat." • "Don’t wear lipstick." This tip is from Caryn at 2 Lads Winery. It’s not just the marks on the glass that are left behind. Lipstick imparts flavors like petroleum and other chemicals when wine passes over your lips. • Carpool. Part of the fun of a group wine tasting is comparing notes about each winery with your companions as your travel. Pile into one person’s vehicle, rent a van, or book a wine tour. And if at all possible, assign a designated driver. Listen to Ellie at Traverse City Tours who warns, "Don’t come on vacation and leave on probation." • Be patient. "Be respectful of other tasters and wait patiently if there’s a crowd," says Chaning at Forty-Five North Vineyard & Winery. When you’re traveling as a group this is especially important since you may have to break into smaller groups, or taste in shifts. We’ve been on several group wine trips and completely agree with Kyle from Riverside Canoes who says, "My best wine tasting tip is to go tasting with your closest friends. The wine always tastes better!." • It’s OK to spit. Ask Bel Lago winemaker Cristin Hosmer and she’ll tell you, "Spitting is OK. In fact it’s encouraged." It cuts down on your consumption of alcohol. So remember, "The dump bucket is your friend." • Chew your sparkles. When tasting a sparkling wine, "You don’t want to drink bubbly like you kiss your grandmother." If you’ve been pursing your lips when you sip sparkling wine from a glass you’ve got it all wrong. Instead,"Chew, hold and slowly swallow," instructs Don at L. Mawby. By chewing the wine the bubbles explode in your mouth allowing the flavors to disperse. Try it. It’s a whole new experience. • Eat mild not wild. "Don’t eat strong flavored foods — onion, garlic and spicy dishes — before or during a wine tour," warns Coryn of Black Star Farms. While a bottle of wine may pair well with some of these dishes, the pungent flavors will linger throughout your wine tour affecting the rest of the wines you taste. • Not a free drunk. Wine tasting is not a free ticket to inebriation. "Don’t treat a wine tour like happy hour at a bar," reminds Tom at Peninsula Cellars. Guests in a tasting room are there to learn about wine, and are offered tastes (sometimes free) to determine which wines they might like best. If you’re more interested in hanging out at a bar and chatting with your girlfriends, you’ve got the wrong kind of bar. Just be respectful of the staff’s time, and the product that they’re freely sharing so that you’ll discover something you’d like to buy. Brandy Wheeler, creator of the Traverse Traveler app and owner of Mealtickets & Unusual Ideas, purchased 13 iPads with the proceeds from the first-annual Traverse Traveler Scavenger Hunt for Autism. The iPads have been donated to Traverse City Area Public Schools for students with Autism Spectrum Disorders. Last April, eighty-four teams took to the streets of downtown Traverse City for the inaugural Scavenger Hunt for Autism. Teams used the Traverse Traveler app and a QR code reader to discover downtown businesses, check-in and unlock a clue for an activity at each location. Volunteers stationed at every venue assisted with the on-site challenge, and handed out prize tickets. Participants encountered puzzles and games that challenged their brains, their sense of direction, and teamwork. The event was a fundraiser for the iPads for Autism program at Traverse City Area Public Schools, a pilot program started in 2011 which provided iPads for 9 students at TCAPS with Autism Spectrum Disorder. To grow this program and meet the needs of their 120 students with autism, Traverse Traveler joined TCAPS Partner in Education program. The Scavenger Hunt drew participation from a diverse crowd of 337 participants including families, educators, children with autism and disabled adults as well as community members from as far as Petoskey. The fundraiser generated donations from event sponsors, team registrations and private donors and raised over $14,700 for the iPads for Autism Program. More than $9000 was donated directly to TCAPS through the Partner in Education program. Over the summer TCAPS added 6 iPads and purchased app packages designed to meet the specific needs of students with Autism. The iPads will help grow a lending library to expedite student assessment, trial different applications and assign devices more quickly. The positive response from event participants and venues, combined with the commitment from title sponsor Lucky Jack’s, has event organizers already planning for next year. For more information on the Traverse Traveler Scavenger Hunt for Autism and to find out how you can volunteer visit TraverseTraveler.com/Autism or find them on Facebook. Photo: Brandy Wheeler from Traverse Traveler and Jame McCall, Special Education Director at Traverse City Area Public Schools gathered today at CityMac for the iPad purchase. They were joined by members of the Scavenger Hunt for Autism committee including Jamie Roster, Kathy DiMercurio, Kate Daggett and Nick Nerbonne, and event sponsors Mike Mohrhardt of Lucky Jacks, Josh Russell of Jimmy Johns and Greg Nickerson from CityMac. April 2nd is World Autism Awarenss Day. It’s a day to recognize, celebrate and show your support for the Autism community. I’ve been celebrating for the last 5 years by sharing information about autism on my personal blog, through social media, and by donating to Autism Speaks. This year I decided it was time to do something bigger. I have a mission to support the autism community in Traverse City, Michigan by putting iPads in the hands of every TCAPS student with Autism. Today, I hope to Light it up Blue by sharing my story, and my goals. This article was first published by the wonderful ladies at Grand Traverse Woman. You can pick up their March/April 2012 print edition on newstands now. Autism is a puzzle. We can’t figure out what causes it. There is no "cure" because it’s not a disease. And it’s affecting an alarming number of children and adults. New studies report 1 in 88 children will be diagnosed with Autism Spectrum Disorder. So what can we do about it? I ask myself that question everyday. I am a mom. My 9-year-old son has Autism. That diagnosis filled me with heart-breaking fears of what his life, and ours, was going to be like now that the A-bomb had been dropped upon us. He was three when we had him evaluated by the school district and the results were clear. Autism. He didn’t make a lot of eye contact, was nowhere near ready to potty train, and had never once said, "I love you, mom." But he was smart. So smart. He memorized jingles on TV and would sing them as we drove past the business. From the backseat I’d hear, "Ba-da, ba-ba-ba, I’m lovin’ it!" as we cruised by McDonalds, followed by, "Higher standards, lower prices," when Meijer came into view. He taught himself to read at the age of three, but still doesn’t know how to tie his shoes. In kindergarten he made a map of the United States out of Play-Doh from memory and could answer Presidential trivia faster than a Jeopardy champion. But if I buy the wrong kind of macaroni and cheese, he won’t eat it. The slightest changes in classroom routine could bring him to tears. Simply understanding that when a friend says, "hello" in the hallway you should look up and say hello in response, doesn’t even occur to him. So how do we, as parents, and community members, reach out and try to connect with these children that are silently struggling to navigate in this world that is so foreign to them? We play to their strengths, and accept their weaknesses. One of my goals, from the time my son was diagnosed, has been to increase autism awareness. It’s challenging, because Autism is a spectrum disorder, which means there are extreme variations in behaviors and capabilities of children with this diagnosis. Some are unable to communicate verbally, some have sensitivities to light and sound and touch. Some children have learning disabilities and may be prone to violence, while others appear typical and perform off-the-charts on achievement. But there are similarities as well. The characteristic that draws my attention is their fascination with technology. Children with Autism are drawn to technology like flies to a picnic. Television, video games, computers, smartphones and now the iPad offer endless fascination and attraction. While we’ve all heard the warnings about the dangers of too much screen time, I don’t think we’ve given enough credit to the benefits for children with certain disabilities. Here technology can be a conduit through which we can communicate like never before. And it’s working. Schools across the Country are beginning to use iPads as a tool for communication and learning for their students with Autism. Each iPad is assigned to a specific student, and loaded with apps that cater to their individual needs. There are communication apps like Proloque2go which help non-verbal students form sentences on the screen with a drag-and-drop motion then turn text-to-speech. There are visual schedules which allow teachers to replace bulky velcro picture boards that took up the full backside of a classroom door and give the independence and privacy back to the students. There are apps for building social skills by practicing conversations, offer iRewards, help students make decisions, and even handle frustration. My new favorite, Sosh, lets you type negative thoughts on the screen then throw them in the shredder and watch as they’re chopped to bits. Technology isn’t just cool for these kids, it’s life-changing. But it does come with a price tag. In 2011 Traverse City Area Public Schools (TCAPS) decided to create a pilot program to test the use of iPads for students with Autism. They purchased 9 iPads, loaded with autism apps and distributed them throughout the district to those with the greatest needs. The trouble is, there are approximately 120 students in TCAPS with Autism. So how do we meet that need when budgets are shrinking and the want list is a mile long? That’s the call I hope to answer. I launched a new development of my own last year, the Traverse Traveler iPhone app. It’s a handy mobile guide to the Traverse Area featuring restaurants, wineries, lodging, shopping, events and more. As with most new technology it takes some time and some tinkering to realize all that it can do. When I heard about the TCAPS iPads for Autism program I realized we had an opportunity to create a unique fundraising event: social media for social good. It’s technology supporting technology, for a cause that’s close to my heart. The Traverse Traveler Scavenger Hunt for Autism will take place from 1pm -3pm on Saturday April 14, 2012 in downtown Traverse City, Michigan. In this one-day event participants will use the Traverse Traveler smartphone app (FREE to download) to conduct a scavenger hunt throughout downtown Traverse City. Teams of up to 5 people will navigate from place to place, use the app to check-in at each location, complete tasks and collect raffle tickets along the way. Instructions for each activity and clues to the next location are supplied by the app. I wanted to create a unique fundraising event that’s fun for families and raises money based on participation. Our presenting sponsor, Lucky Jack’s bought into our fundraising concept to Pay-Per-Check-in, whereby increasing the monies raised with every person, and every stop. All proceeds from the event will be donated to TCAPS to purchase iPads and apps for students with Autism. Donate a used iPad2 to TCAPS. Drop off your used iPads at CityMac and TCAPS will mail you a receipt for your tax deductible donation. Make a cash Donation to the iPads for Autism program. $500 will purchase an iPad. $150 will purchase a suite of apps. Every dollar helps! The first annual Traverse Traveler Scavenger Hunt for Autism will take place in Traverse City, Michigan on Saturday, April 14, from 1:00 p.m. to 3:00 p.m. In this one-day event participants will use the Traverse Traveler smartphone app to conduct a scavenger hunt throughout downtown Traverse City. Utilizing an innovative approach to fundraising, the event will raise money to purchase iPads for Traverse City Area Public Schools students with Autism Spectrum Disorder. Participants register as teams for one of two event tracks: the Family Track featuring kid-friendly activities and less walking, and the Challenge Track geared toward adults and teens. All courses are family-friendly, walkable and fun. Teams of up to 5 people will navigate from business to business, use the Traverse Traveler smartphone app (available for FREE in the iPhone App Store) to ‘check in’ at each location, complete tasks and collect prize tickets along the way. Instructions for each activity and clues to the next location are supplied by the app. At the end of the scavenger hunt, all teams will cross the finish line at the City Opera House to celebrate their accomplishments, enjoy refreshments and win prizes. Corporate and individual donors commit to ‘Pledge Per Check-in,’ whereby increasing the fundraising efforts with every person, and every stop. Brandy Wheeler, creator of the Traverse Traveler app, a handy mobile guide to the Traverse City region, designed this unique event to increase community awareness about Autism, a disorder that affects 1 in 110 children — including her 9-year-old son. There are approximately 120 students in TCAPS with Autism. It’s a neurological disorder that can impair an individual’s ability to communicate and develop social skills. The severity of the disorder and the symptoms vary dramatically. Some children are unable to develop speech, some experience sensory issues, and others, diagnosed with Aspergers Syndrome, are highly intelligent but lack basic social skills most people take for granted. In early 2011 Wheeler discovered a pilot program launched by TCAPS to place iPads with 9 students within the district who receive special education services for autism. Each device was loaded with a set of apps chosen to meet the specific needs of that child. Autism apps range from touch-screen visual schedules, to social skills practice, to full-scale communication aids. Jame McCall, Executive Director of Special Education & Early Childhood Programs for TCAPS explains, "Our goal with using the iPads— or any other assistive technology— is to remove the barriers to education. To be able to put a device in the hands of a child that’s socially acceptable, and is something they are able to use and maneuver easily, that aids in communication, will help them in their learning." Traverse Traveler approached TCAPS last fall about designing a fundraiser to help grow the iPads for Autism program at TCAPS. "I was thrilled that Brandy contacted me and told me about her plans to do a scavenger hunt and her thoughts about raising money for TCAPS students to put more iPads in the hands of our children that needed them. TCAPS is proud to be a partner with the Traverse Traveler." Brandy Wheeler reached out to business owners, community members, educators and parents to bring this event to life. "Children with autism are magnetically drawn to technology," she said, " With this event we can combine the power of mobile and social media to create positive social change. It’s technology for technology." All proceeds from the event will be donated to purchase iPads and apps for TCAPS students with Autism Spectrum Disorder and Aspergers Syndrome. In addition to monies raised by the event, Traverse Traveler will donate $10 for every new business listing on the app between now and April 30, 2012. The Traverse Traveler Scavenger Hunt for Autism is currently seeking event sponsors and Downtown Traverse City businesses who would like to participate in this event. For more information and to register a team, visit the Traverse Traveler website at: http://TraverseTraveler.com/Autism. TCAPS is also accepting tax-deductible cash donations for the iPads for Autism program at http://www.tcaps.net/autism. Become a fan of the event on Facebook, and follow @TraverseTravelr on Twitter to keep up with event news as it happens. 10. Traverse Traveler hits 1000 downloads. We kick-started the New Year by reaching a goal we hadn’t imagined. After launching the Traverse Traveler iPhone App at the end of 2010 the local community and area visitors showed overwhelming support. Our app downloads hit 1000 in the first 25 days. 9. Mealtickets Family Grows. I refer to our advertisers as the Mealtickets Family. This year our family grew to welcome the Cherryland Antique Mall, Dennos Museum Center, Elk Rapids Chamber, Becky Thatcher Designs, Great Lakes Children’s Museum and Mana to our little card gang. We’re proud to offer information on such great businesses in Traverse City and the surrounding area. It makes my job easy when I represent great clients! So thanks everyone. 8. All a Twitter. It’s hard to believe I have been on Twitter for less than a year. But it took me a while to make the commitment to another social media platform. And yet, I think it’s one of the best decisions I made all year. The people I’ve met on Twitter have been fantastic. It has broadened my knowledge base, and sparked networking opportunities I never imagined. If you have a small business I highly recommend joining Twitter. In fact, I wrote a blog post here about just that. If you’re in Northern Michigan might I suggest you follow the hashtags #nwmi #TCMI and #mittenlove to find some likeminded friends. And by all means, follow me @TraverseTravelr! 7. 10 Places I’ve Never Been. It all started with an article in Grand Traverse Woman Magazine. Looking to encourage locals to get out in their own backyard and open doors they’ve never opened, I wrote a list of 10 Places I’ve Never Been and set out to visit each one. My list took me across Benzie, Leelanau and Traverse City, into restaurants, wineries, jewelry, furniture and retails stores. I met great people, and I spent my dollars with local businesses. It was a great experience. In fact, don’t be surprised if my explorations return in 2012. When I stop and think about it there are so many more than 10 places that I have yet to visit. I reported on my travels once a week throughout the summer, here on the Mealtickets blog. If you haven’t read them, I hope you will. You’ll discover some of the magic that makes Northern Michigan so unique. 6. Rockin’ with the Traverse City Lip Dub. When I heard about plans to make a Traverse City Lip Dub I thought it would be fun to work behind-the-scenes to make it happen. But when I appeared at the first meeting I threw my hat in the ring and auditioned to be one of the "singers". Who knew I’d make the cut! So after one month of planning, rehearsing, and one beastly hot day in downtown Traverse City, our community came together to pull off a creative rendition of "You Can Call Me Al," and "Jump" lip-synced throughout town. The performers were dedicated. The social media engine buzzed about the big debut at the Traverse City Film Festival. And thousands of people gathered at the Open Space to watch the premiere before an outdoor showing of Star Wars: The Empire Strikes Back. Finally the TC Lip Dub went on YouTube for all the masses. And then they pulled the plug. At the end of the day, it was still a highlight of my year, and I’m proud to say, "You Can Call Me Al." 5. Sleeping Bear Dunes Named America’s Most Beautiful Place. You couldn’t have missed this story unless you were out of State — perhaps out of the Country. That just goes to show how proud we Michiganders are of our beautiful location. This summer, a small community in the heart of Leelanau County created a nation-wide buzz about the Sleeping Bear Dunes by voting on Good Morning America’s contest. Some were shocked that we beat out places like Hawaii and California, but not us locals. This win showcased not only the power of social media, but the strength we have when we, as a community, come together to show our support for this region. If you voted for this win, you helped make it happen. And this win has already brought thousands of New visitors to Northern Michigan. And that’s something I’m passionate about indeed. 4. Visual Marketing Book Includes Traverse Traveler. My first publication! Traverse Traveler app was selected from a pool of over 500 applicants to be included in a new book by David Langdon and Anita Campbell. Visual Marketing: 99 Proven Ways for Small Businesses to Market with Images & Design debuted in September with a spread on the Traverse Traveler app. I was thrilled to be selected for this book which recognized our success in taking a print-based business (Mealtickets) and expanding into a mobile version that works (Traverse Traveler). The book includes 99 great stories of marketing strategies that have been successful, along with a Takeaway Tip for each one so you can apply it to your own business. 3. A Mention on Forbes.com! This one was exciting enough to warrant some local news coverage, so I think it deserves its own listing in our Top 10. The author of the Visual Marketing book was interviewed on Forbes.com about the new release. In her interview, she sited three examples from the book, including Traverse Traveler. Read the article here. It’s a great overview of the Visual Marketing book, and it gave me a reason to smile when I discovered the interview on Twitter. 2. Traverse Traveler Hits 5000 Downloads. I had high hopes for how the Traverse City community and local visitors would respond to our app, but I couldn’t imagine 5000 downloads in less than a year. I’m thrilled to say we will finish 2011 with over 6100 downloads and counting. I have big goals for 2012 including the much awaited launch of an Android version of the app, a BIG fundraising event from Traverse Traveler, and hopefully lots of new businesses adding their listings to our categories. Is your business on the app? If not, I’d be remiss if I didn’t say, Sign Up Here! 1. Mealtickets Celebrates 10 Years in Business. Saving the best for last, I’m proud to say I’ve been an momtrepreneur for 10 years! I started Mealtickets & Unusual Ideas on November 1, 2001 after losing my graphic design job in the wake of 9/11. It’s been a challenge to learn new skills — like sales — and a pleasure to work with this regions wonderful hospitality industry and small business owners. In 10 years Mealtickets has distributed millions of little cards to help area visitors discover unique, off-the-beaten-path restaurants, attractions and wineries. And for that I couldn’t be more proud. It is my Top moment in 2011. If you made it through that list of horn tooting, I thank you! It’s amazing to me that all fit in one calendar year. But if you’re wondering what I could possibly have left to do in 2012, have no fear. I’m a busy body, who is always looking for the next challenge. And I’ve got some great ideas for 2012. So I hope you’ll stay with us. Happy New Year everyone! I hope your 2012 is a great success. And if there’s any way Mealtickets or Traverse Traveler can help make that happen, please let me know. I’m thrilled to announce the Traverse Traveler app will be included in a new creative idea book featuring 99 examples of successful marketing strategies. Visual Marketing displays creative marketing campaigns that brought attention to small businesses in unique, compelling, and unexpected ways. I’m anxiously awaiting a copy to see the creative ideas from other designers, artists, entrepreneurs and small businesses featured in this collection. I hope you’ll pay a visit to your local bookstore and pick up a copy. It is also available on Amazon and in eBook format for those who love their tablets! I arrived at 22 Vines & Wines Cafe & Market in the middle of lunch hour. All five of the booths were full and the owner, Rich Van Steenis was scurrying about filling water, taking orders and delivering hot food from the kitchen. Wouldn’t you know they were short staffed and Rich was the only waiter. As I waited for a friend to join me I was able to scan the tables and soak up the amazing smells wafting from the little kitchen in back. A Thai chicken pizza was delivered to guests at the table across from me, carried in on a wooden plank. The smell was fantastic. 22 Vines & Wines Cafe & Market is located right on M-22 just south of Suttons Bay. In fact, it’s next door to another one of my 10 Places: Chateau de Leelanau. The Hilltop complex, which also houses Gallery 22 and the Leelanau Chamber, is owned by the Van Steenis family. They purchased the property, a former dairy farm, in 1977 and converted it to retail space for Rich’s mother. When she decided to retire in 2008 it was time for further renovations. What once was a milking room, is now a 10-year dream come true for Rich’s wife Salve. But I’ll get to that later. First you need to see what Salve can do. My friend arrived promptly and we examined the menu with interest. I changed my mind a dozen times because everything sounded so good. The handmade thin-crust pizzas looked fabulous, but were too big for our appetites. Besides I hoped to try more than one dish. So we decided to share an appetizer of Thai rolls and each ordered tacos for lunch. The chef recommended a split order of spring rolls and summer rolls. The spring rolls are made from ground round, cabbage, carrot and bean sprouts, rolled im a rice wrapper and lightly sauteed (not fried). The summer rolls are fresh and cool. Steamed shrimp and crisp veggies are rolled up with rice noodles in a rice wrapper and served cold. They provided two sauces for dipping—a spicy soy and spicy peanut. Both rolls were excellent…even though we paired them with the wrong sauces! For lunch I chose the shrimp tacos, since they were grilled. My friend opted for the fried fish tacos. And we were both happy with our decisions. They were served two to a plate, topped with lettuce, cheese, thai cream sauce and fresh salsa. I paired mine with a jasmine ice tea. Lunch was filling, but at the same time it felt light. Which, was a great way to finish a meal. Instead of feeling stuffed and regretful I was looking forward to a trip back. And I was dying to see more of Salve’s thai dishes. Lucky for me, there were a few more coming out of the kitchen. When I mentioned on Twitter that I was headed to 22 Vines & Wines Cafe I had some suggestions from followers, which included the Tum Yum Soup. Now that I’ve seen it, I know I’ll be trying that next time. This traditional Thai dish is one Salve modeled after the Bangkok street vendors who would make the soup on a cart while you wait. At 22 Vines & Wines Cafe they offer a seafood version with shrimp, scallops and mussels, a tofu version, or chicken, shown here. You can order it mild, medium or spicy. Here are a couple other dishes to inspire your taste buds. Bet you’re feeling hungry now. There’s more to 22 Vines & Wines Cafe…it’s the Market. So after lunch I did a little exploring. The restaurant lies on the corner at the front end of the building. When you walk in seating stretches along each side of the room in front of you, with a bar at the back. On the other side of the wall lies the Market. The cafe opened in the fall of 2010, but the market just opened this May. It appears to be a work in progress. But the focus is clearly on locally made products, including beer, wine and spirits, as well as the unique Asian food staples that they feature in the cafe. There’s an ice cream counter in the front of the market that sells Moomer’s ice cream, and in the back, near the kitchen you’ll find a small bakery display with truffles from Chocolate Exotica, and homemade cookies. The shelves are only partially filled but what I saw represented many of my favorite local food stuffs. Naturally Nutty nut butters and spreads, Stone House Bread, Sleeping Bear Farms honey and other Leelanau county products lined the shelves. After my wandering I sat down with the owner to find out how they decided to open a Thai restaurant in Suttons Bay. Rich and Salve Van Steenis met in her cafe in Manilla, Philippines while Rich was visiting the island on for a diving trip. Salve, who came from a family of rice farmers, broke away from the tradition to follow her dreams in the kitchen. She has been cooking for 25 years. It took 10 years to convince Rich to open a restaurant here. Since he retired in 2008, he decided it was time for Salve to have her wish. They’ve taken nine trips to Thailand, thus her passion for the flavors of that region. Since I am a strong supporter of Michigan wine, I had to ask about their name, and the connection they have to the Michigan wine region. The location of the property, along M-22, combined with the fact that they are surrounded by Leelanau county wineries, lead to a restaurant name that would attract a wine-tasting crowd. And yet, I discovered an anomaly. I was surprised, and a bit disappointed to discover that 22 Vines & Wines Cafe does not pour a house Michigan wine. In fact, it’s from California. According to Rich they opted not to pour a house wine from Michigan because they didn’t want to take away from the tasting experiences at the wineries around them. "They represent their products really well. We don’t want to compete with that," he added. What they do offer, which may calm the Michigan wine fans out there, is a large selection of Michigan wines by the bottle at retail prices that match the wineries. You can purchase a bottle in the market next door, and for a $5 cork fee you can enjoy that wine with your dinner. I did notice several local Michigan craft beers on tap, including Right Brain Brewery, North Peak and Bells. They have many others available in the market coolers as well as distilled spirits from Grand Traverse Distillery and Black Star Farms. At the end of the day I was really impressed with the dishes that came from Salve’s kitchen. They’ve created a restaurant that was supposed to appeal to a wine tasting crowd of tourists and instead impressed the locals so much they have many regulars who come several times a week. I know I’ll be back again to try that Tum Yum Soup…and maybe a coconut macaroon for dessert. They looked so tempting. On your next trip wine tasting along the Leelanau Peninsula, think about stopping by 22 Vines & Wines Cafe & Market. You can find them at 5046 SW Bay Shore Drive, Suttons Bay. They offer dine in, or carry out so give them a call at 231.271.2221. And you can even check out their website at www.22-vines.com. As with all my 10 Places locations, I’ll be adding them to the Traverse Traveler iPhone app — our free mobile guide to the Traverse Area. Download on iTunes here. If there’s a place in northern Michigan you’ve been dying to visit, but you’ve never made the time, I’d like to hear about it. Join the conversation on the Traverse Traveler Facebook page, and let me know where you’re going. And stay tuned, as I plan to explore the next stop on my 10 Places I’ve Never Been tour: Country Christmas. It’s Official, the Traverse City Lip Dub is online and ready for viewing. But did you know Traverse Traveler played a role in the production? When I found out the Traverse City Film Festival was planning on creating a Lip Dub I jumped at the chance to get in on the ground level. After art directing a few TV commercials when I worked at a local ad agency I discovered I loved working behind-the-scenes on film productions. So I thought it would be fun to be involved in a community project that was designed to promote my town, Traverse City. It turned out to be a great event. Over 100 people attended the kick-off meeting when we didn’t even know what the songs would be. With a handful of meetings and only a couple rehearsals, Max Fisher and the crew at FishSoup Films pulled together hundreds of Traverse City residents who were proud to showcase what an amazing town we live in. From the beginning this was an open event, where ideas were welcomed, shared and incorporated. Community members of all ages participated and represented dozens of organizations, teams, businesses and venues. I walked into the first meeting expecting to work behind the scenes, and ended up in front of the camera. So I thought I’d have some fun with it. I decided to print a limited edition Traverse Traveler t-shirt to give away to my volunteer "crew" during the lip dub. And when I had one shirt left I saved it for a special givaway after the lip dub’s release. It’s time for that giveaway! 3. You have until this Friday, August 5th* to email me with the lines I sing during the lip dub. *The original deadline has been extended since the lip dub was released later than expected. A winner will be drawn from the correct submissions. I hope you enjoy the Traverse City Lip Dub. It was a blast to be a part of this creative expression that all started as an idea from a couple of TCFF interns. It just goes to show what you can pull off when you put your mind to it—and spread the word to a few thousand friends on Facebook! In honor of the premiere of the Traverse City Lip Dub during the Traverse City Film Festival we are announcing a giveaway for a lucky Traverse Traveler fan. 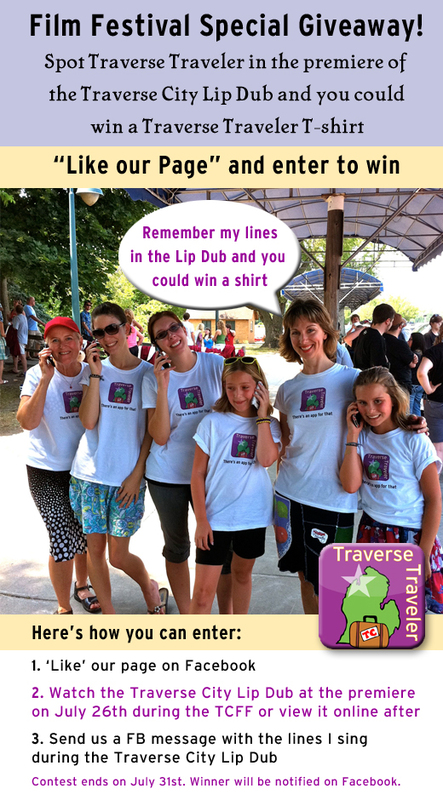 Did you know, Traverse Traveler had the opportunity to take part in the Traverse City Lip Dub? Brandy Wheeler, owner of Mealtickets & Unusual Ideas —the Traverse Traveler — was one of the singers in the community production created by FishSoup Films and the Traverse City Film Festival? In honor of the premiere of the Lip Dub on Tuesday July 26th at the open space, Traverse Traveler is holding a contest to giveaway one of the T-shirts specially created for the Traverse Traveler crew. To enter to win "Like" our Traverse Traveler Facebook page, then send us a message with the lines Brandy sings on the Traverse City Lip Dub. Not on Facebook? Email us here with the lines Brandy sings and you’ll be entered to win. Contest ends at the end of the TCFF on July 31st. 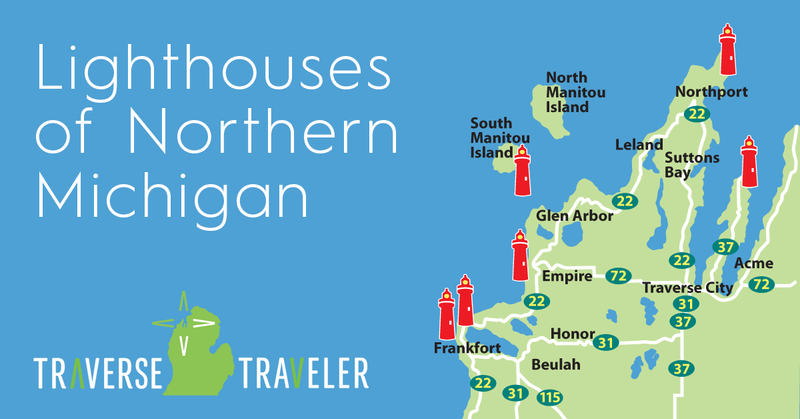 Pure Michigan debuts the new Traverse City "True North" ad today. I’m excited to see my hometown featured on the Pure Michigan campaign, where millions of viewers can admire our beautiful community from a comfy cushion in their living room as Tim Allen’s voice lulls them into a state of utopia. With any luck they’ll be convinced that Traverse City is where they want to spend their next vacation. And since planning the vacation is part of the fun, I hope the next step they take is to reach for their iPhone and download our handy mobile guide, the Traverse Traveler app. It’s a great resource for designing that trip to Traverse —whether you’re at home, abroad, at an airport or lying in bed watching TV. Click here to download the app on your iPhone! Mealtickets & Unusual Ideas is proud to present a brand new iPhone app called Traverse Traveler. The Traverse Traveler iPhone app is a handy mobile guide for the Traverse area visitor designed to promote local restaurants, wineries, attractions, shopping, events, services and more. And best of all…it’s a FREE download for iPhone and iTouch users. Whether you’re planning a trip to northwest Michigan, or are lucky enough to live here, this app makes it much easier to find local businesses. Today’s smart phone user is accustomed to finding everything they need right there in the app store. And now they can find information about Traverse City there too. Want to plan a wine tour that includes a nearby restaurant stop for lunch? Our app can do that. Need to find the quickest route from your hotel to the ski lodge to meet friends? Our app can do that. You just arrived in town and wondered if there are any events to check out? Our app can show you that too. What makes Traverse Traveler unique? There are thousands of apps out there, many of which promote restaurants, movie theaters or general information about an area. So what makes Traverse Traveler unique? Listings are ordered by proximity to the iPhone user. So if you’re hanging out Benzie county, the listings nearest to you come up first. This is helpful for finding a hotel or the closest bar. Maps & directions make it easy to navigate from one location to the next. Great for planning a wine tour or discovering that off-the-beaten-path restaurant. Social sharing from the app means you can post to Facebook or Twitter, or email info to your friends without leaving the app. Events by date let you know what’s going on while you’re in town. Near Me feature pinpoints the 25 listings closest to you, from within all categories. See exactly how close your hotel is ski lodge to plan your drive time. Not only is Traverse Traveler a FREE download, it’s also free for local businesses to get a listing. Submit information to us and you can receive a FREE basic listing in the Traverse Traveler app. Basic listings are free, and we’re glad to give them. The enhanced listings will give you a lot more interactive options and visual presence in the app—if you’re into that kind of thing. You can link to your website and email, add photos to your listing, promote events and specials, and utilize social media. So if you have an active online presence, you might want to consider this valuable addition. And we’re selling them for only $99/year, so why not? Visit the all new Traverse Traveler website to learn more about the app. List Your Business today! Why develop an iPhone app for Mealtickets? The Mealtickets & Unusual Ideas mission has always been to provide Traverse area visitors with useful information and directions to local restaurants and attractions, in a colorful, convenient and portable way. The number one reason our little cards are so popular among visitors is their size. Travelers love them because they fit in their pocket or purse. Right next to their phone. An iPhone app is a perfect expansion of the services we provide as it fits our mission to a tee. We work hard to keep up with technology, and the needs of our customers. The app is a great way to do just that. We hope you’ll agree. Mealtickets & Unusual Ideas also believes in keeping it local. Our card displays feature only distinctive, locally-owned restaurants and attractions because that’s what makes our area unique. And our Mealtickets advertisers benefit most of all. Card advertisers receive a fully-enhanced listing in the Traverse Traveler iPhone app as part of the service, at no additional cost. Now is the best time to become a Mealtickets advertiser and take advantage of this great new feature. To advertise with Mealtickets & Unusual Ideas contact us at info@mealtickets.com. To list your business on the Traverse Traveler app, click here for our easy online forms. To download the Traverse Traveler iPhone app, click here.